Recipe by: "Motley" & "Evil"
"A taste of the ocean! 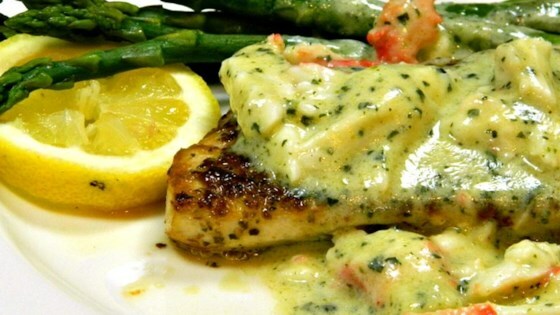 Creamy pesto sauce with lump crab meat over a delicious fillet of mahi mahi. This dish also works well with a parma rosa sauce and catfish!" Heat a small amount of the olive oil in a non-stick skillet over medium heat. Season mahi mahi with oregano, salt, and white pepper; cook in skillet until the flesh flakes easily with a fork, 7 to 10 minutes per side. While fish cooks, whisk remaining olive oil, milk, and creamy pesto sauce mix together in a saucepan over medium-low heat; cook, stirring regularly, until it begins to thicken, 3 to 5 minutes. Remove saucepan from heat and stir crabmeat into the sauce. Transfer cooked mahi mahi to plates and spoon sauce over the fish. Very good and easy to make. I added basil with the oregano and had to use canned crab. We don’t get much fresh crab in Tn. Delicious! The perfect compliment to mahi mahi. I used half cream, half milk because I only had 2%, but it was amazing! Will definitely make this again.